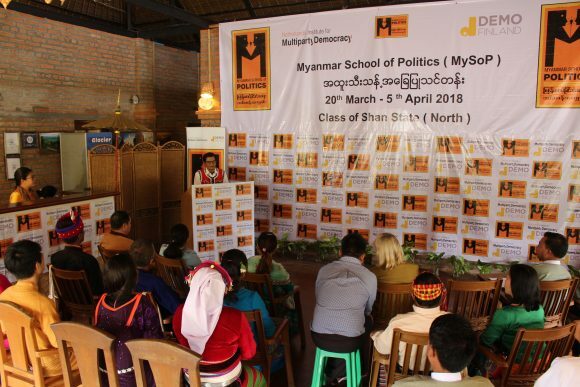 The 11th Myanmar School of Politics Core Course – an intensive political training course – came to an end in Hsipaw township, Shan State on 5 April. Mr U Tin Oo, the General Attorney of Shan State, who is himself a MySoP alumni, and H.E. Riikka Laatu, Finnish Ambassador to Myanmar, delivered the closing speeches. They presented graduation certificates to the 16 graduates. In addition, the Chair of the Election Sub-Commission of Shan State (North), Mr U Loke Yoon, gave his encouragement in a speech to the graduates. Working across party lines, the School of Politics brought together 15 politicians from nine different political parties together as well as members of the Election Sub-Commission of Shan State to study and practice democratic politics. The Core Course focuses on the strengthening capacities of politicians as well as enhancing the practice of multiparty dialogue. 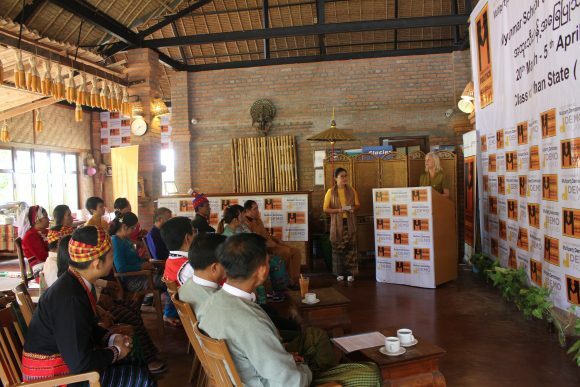 This Course included political theory, and skills training such as speech writing and campaigning, gender in politics, election rules and regulations, and reconciliation in the peace process. The participants also discussed the role of political parties in economic development and how to operate as state level politicians, as well as making a country comparison with the democratic transition in Indonesia. Trainers from Myanmar, the Netherlands and Indonesia conducted the course from 20 March to 5 April. 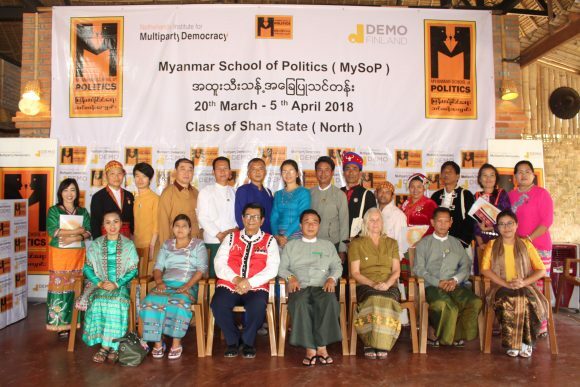 Organised by NIMD and Demo Finland, the Myanmar School of Politics (MySoP) provides training courses to strengthen the democratic role of politicians and political parties, and enhance the practice of multiparty dialogue.